Your request to Houston 311 has been accepted. Your service request ID is #291355. 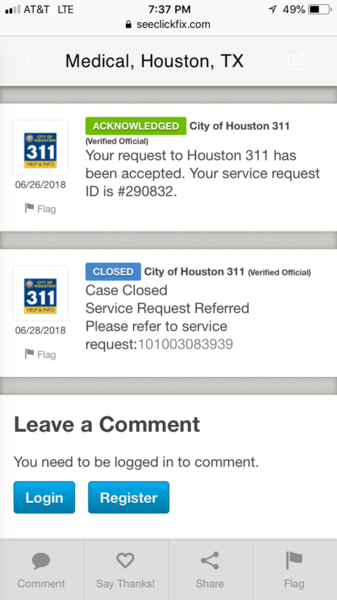 Your request to Houston 311 has been accepted. Your service request ID is #291332. Your request to Houston 311 has been accepted. Your service request ID is #289843. And I got an email saying the issue was resolved. It wasn't. Trash still hasn't been picked up. Please fix it. Your request to Houston 311 has been accepted. Your service request ID is #291283. Not sure why this was closed, but it shouldn’t have been. Your request to Houston 311 has been accepted. Your service request ID is #291201. Your request to Houston 311 has been accepted. Your service request ID is #291200. Your request to Houston 311 has been accepted. Your service request ID is #291039. Those covers are missing long ago, reported months ago, not fixing yet. Your request to Houston 311 has been accepted. Your service request ID is #290922. We shut off sprinkler so it is not the sprinkler line. Your request to Houston 311 has been accepted. Your service request ID is #290602. Your request to Houston 311 has been accepted. Your service request ID is #287704.